**Customer Segments: **Product managers/marketers are responsible for identifying the most important customer segments a startup will pursue. Picking the right customer segments increases profitability, maximizes market size and prioritize the most attractive customer for the business. Very few businesses target only one type of customer. Market places cater to buyers and sellers. SaaS companies may pursue small, medium and enterprise customers, many times across industry categories. Even pure consumer businesses like social networks can divide their user bases intteoateno celebrities, influencers, and the common user, for example. Content marketing efforts must reflect the core strategy of the business and prioritize the most important few segments. The content a startup produces must resonate with these target segments. It’s not to say each blog post or tweet must strike a chord with every segment each time, but that there ought to be some content for targeting each segment specifically. Customer Lifecycle: Before buying a product, a customer progresses through a journey. They educate themselves about a space to understand whether they have a need. They understand the key attributes of products in the sector. Next, they make a buying decision. Then, they may try to maximize the value of the product. Last, the customer may be unsatisfied and possibly churn. Ideally, each of these stages of the lifecycle, for each of the key customer segments mentioned above, should be handled by content marketing in some form. Zuora’s three doors concept is a good example of this value proposition delivered in a website. Content Types: Great content marketing strategy should leverage all of the available tools to maximize success. First, teams should vary content types. For example, in a blog writers should vary interviews, lists, how-tos, personal interest stories. Each format provides a unique view into a space and a company’s position within it. Content marketing doesn’t stop at blogging and social media. Events are powerful tools for content marketing which blend a company’s voice with influencers’ voices and customer points of view. This social proof is a powerful force for sales. Look at most SaaS websites today’s including Looker’s, and you’ll see the value proposition is quite often articulated by the company’s customers. Content in customer support canned responses, in product messaging, company communities and help pages are often forgotten places for content marketing efforts to shine and potentially retain customers at risk of churning. Mailchimp does this well. 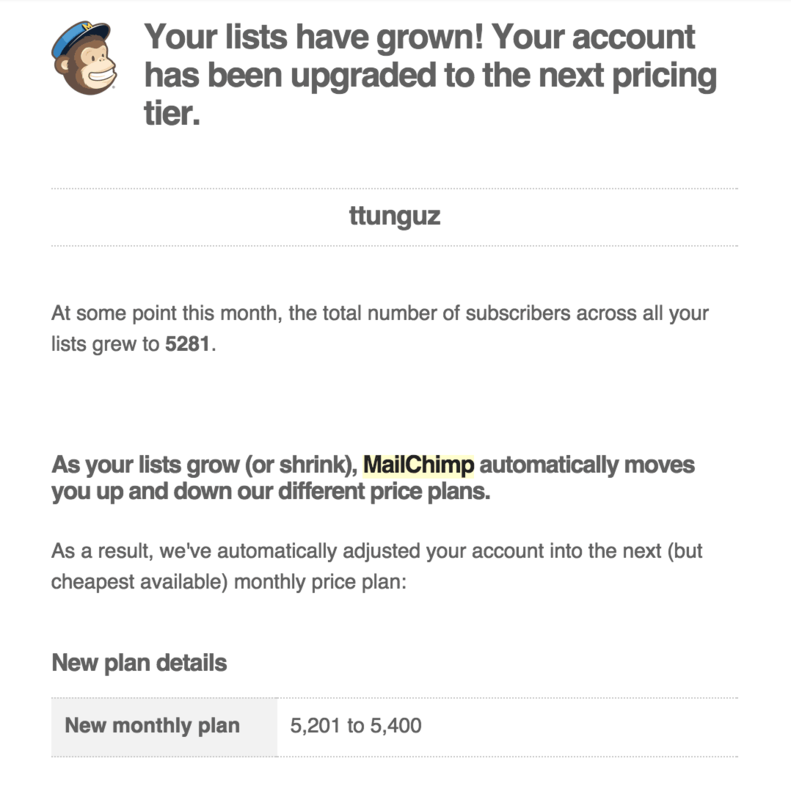 When a Mailchimp customer’s email list grows, the Mailchimp team automatically sends an email congratulating the company on its success. Note the company never mentions the increase in cost to the customer, instead focusing on the customer’s success. It’s ingenious. The most sophisticated content marketing strategies consider these three factors and the teams develop a content marketing calendar that creates a steady drumbeat of relevant material for each segment, at each of the key stages in the lifecycle, while varying the delivery mechanism. 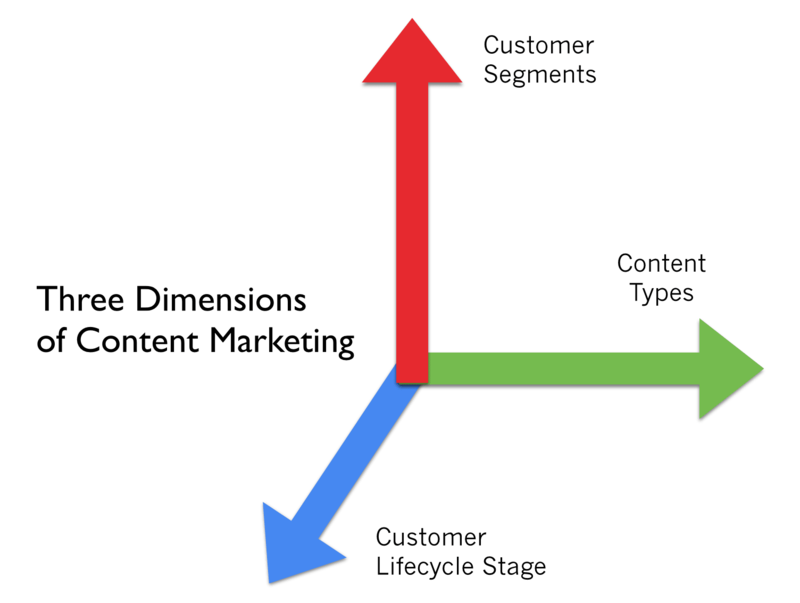 These three dimensions (segments, lifecycle, content type) can create quite a bit of complexity very quickly. Most startups tend to focus on one segment across a lifecycle for a few content types. As the content marketing team grows, so does the complexity. But this framework provides one roadmap for how to start from a simple content marketing program and evolve into a complex but well orchestrated strategy.